Chicken? Where we’re going, we don’t need chicken. I try not to pay too much attention to a restaurant’s PR push before I eat there, as the nauseating buzzwords, jargon and marketing waffle can colour my view of the place before it’s even opened. 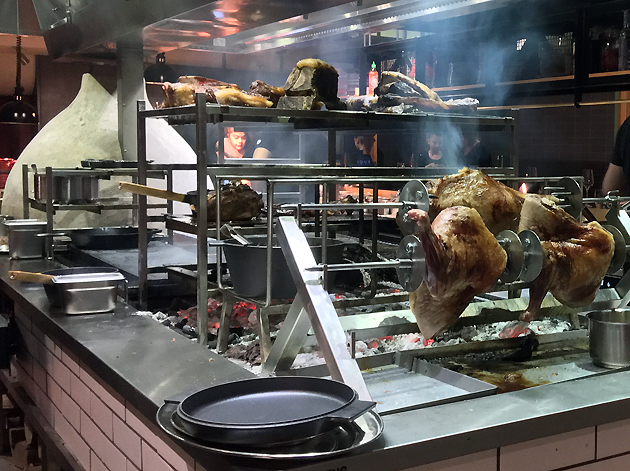 This was hard to do when it came to Temper though, Neil Rankin’s latest restaurant serving up heaving portions of barbecued and grilled meat in the heart of Soho. 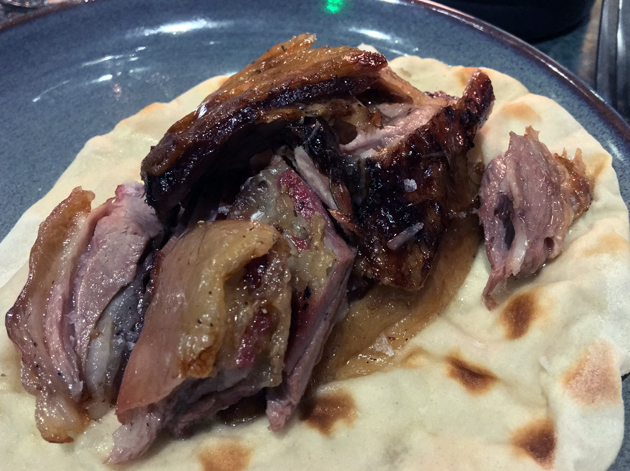 Serving barbecue, shawarma and tacos all under the same roof smacked of bandwagon-jumping, shoving three of the most popular London restaurant cuisines of recent years – barbecue, Mexican and Levantine – onto the same menu. In an unplanned and somewhat ill-tempered Twitter conversation a few months before opening (pun intended – all my puns are intended), Rankin himself tried to convince me that this wasn’t the case – his use of entire animal carcasses meant that shawarma was a logical way of using shreds of leg meat that would otherwise have gone to waste. Meanwhile, the tortillas used in the tacos were made using animal fat that would’ve otherwise gone unused and they were apparently made using a proper nixtamalisation technique to boot which would be a mean feat. As is usually the case, the best seats in the house are at the counter surrounding the kitchen. Although Rankin’s words were moderately persuasive, most of my fears were only properly assuaged when I stepped through the shiny front door. Although the presence of tacos is still rather conspicuous, the shawarma is served mixed in with other cuts of whatever meat you order with thankfully little sign of tzatziki, labneh or other Middle Eastern staples shoehorned in. And the prolific Rankin is, of course, known for his barbecue at other restaurants. Having said all that, the quality of the tortillas used in the tacos on my first meal were disappointing. Although made from maize rather than wheat, they were a little too thick, stiff and flavourless. They were also a little too small for the generous helping of filling which, combined with their inflexible, unyielding stiffness, made for messy eating. 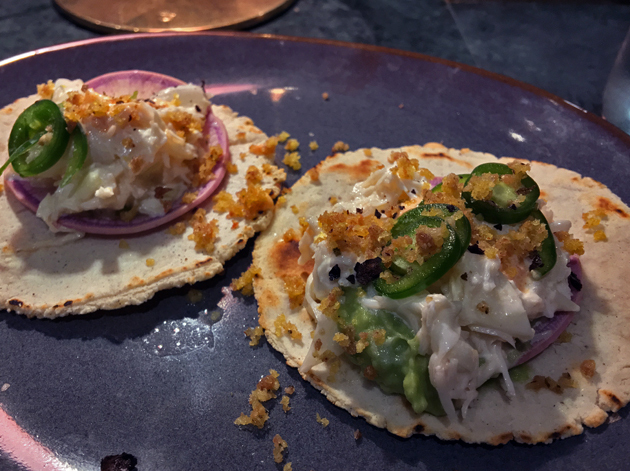 A taco filling of crab and pickled onion pork skin was nothing more than a generic, bland and textureless white blob with only the punchy, tingly chillies standing out. If you don’t agree with what I’ve written, then please don’t lose your temper in the Comments. 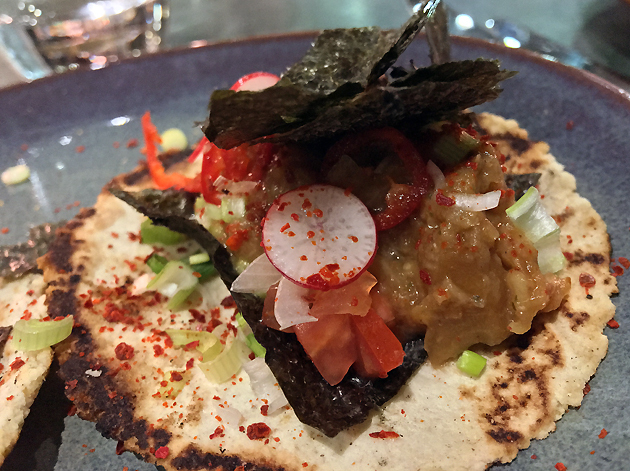 Far superior were the tacos filled with raw soy-cured beef. Chewy, a little gelatinous and resplendent with umami, the cubes of beef almost resembled sashimi-quality tuna in their glistening moreishness (not the fatty toro or otoro tuna, of course). Plenty of crisp, fresh and sharp vegetal garnishes helped cut through the umami richness of the meat. Temper your enthusiasm, if you will. Temper’s kitchen clearly as an affinity for cow. The cuts of smoked beef you get will vary as the kitchen and other diners work their way through the animal. If you’re lucky, you’ll get the chance to feast on juicy, expertly cooked bits of rib, feather blade and sirloin. Charred and chewy, then moist and exceptionally tender with the gentle metallic tang of an animal that had lived and died well. All the main dish meats are sold in 100g portions so you can eat as little or as much as you want. Jerk sweet potato and pineapple wasn’t the Brixton-aping fusion mash up that I feared it would be. The fruity and lightly spiced mash wore its pineapple influence lightly, presenting a far more balanced and less garish taste then I had expected. The stools at the counter surrounding the kitchen are actually comfortable – even for my voluminous backside and stubby stature. Kougin amman is a notoriously tricky Breton pastry to make so it’s no surprise that Temper’s version needed a bit more finesse – a bit too chewy and not quite soft enough, it erred on the wrong side of stodgy. 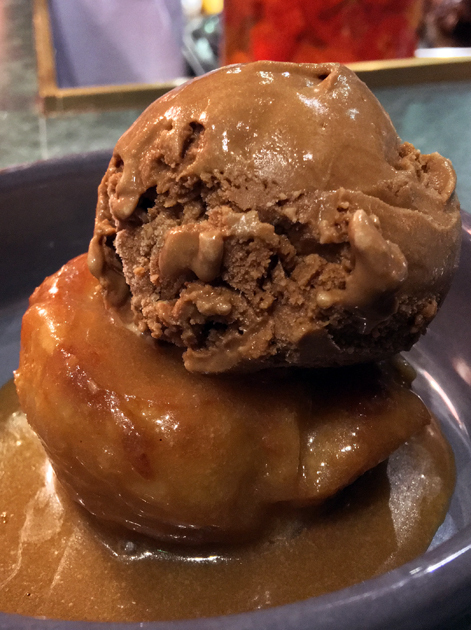 The dulce de leche ice cream spooned on top was bland as well as a bit too crunchy and icy. 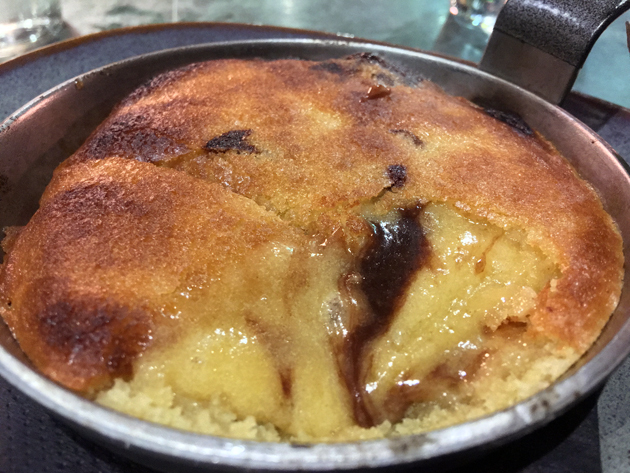 It was up to the butterscotch to save this dessert with its intense and addictive sugary sweet burnt butteriness. Give me a tub of that stuff, instead, and a spoon. Everyone pronounces ‘kougin amman’ wrong. Temper’s kitchen doesn’t stand still, especially when it comes to its maize tortillas. They were better than they were before, but there’s still room for improvement. 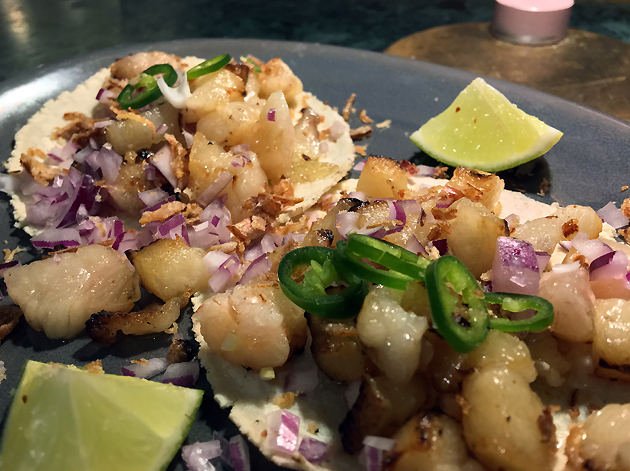 While more pliable and noticeably less stiff than the first time around, they were still lacking in character compared to the very best corn tortillas. 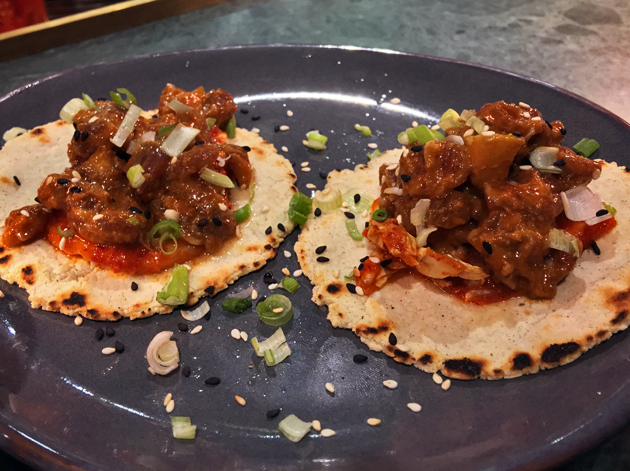 Tacos filled with aubergine and chipotle miso were reminiscent of the somewhat overwrought fusion-y fare at Foley’s. Baba ghaboush-esque pureed aubergine clashed with the nori, radish and, most notably, the blunt force chipotle. The subdued miso, meanwhile, was lost in the mix. It might sound good from the menu description, but the lack of balance on the tongue was evident from the first mouthful. A weak link in the chain. 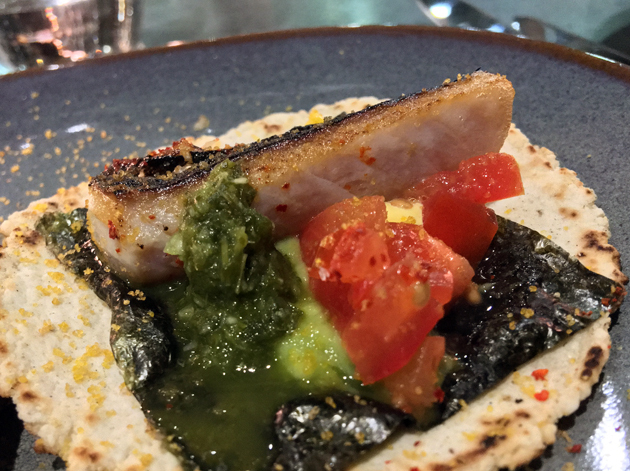 Far more successful were tacos filled with blowtorched mackerel. Quivering, punchy slivers of fish were neatly complimented by a sharp, sprightly sauce and an umami pairing of nori and tomatoes. Fix the tortillas and you’d have a knock-out pair of tacos right here. Unlike some other meat-focussed restaurants and steak/chophouses, the atmosphere here wasn’t toxified by starched collar wideboys with testosterone poisoning. It was a much more mixed and laid back crowd in my experience. 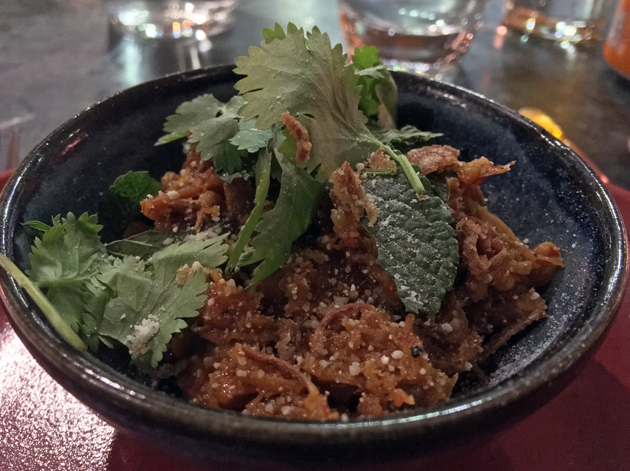 While Temper’s grab bag selection of smoked and grilled pork didn’t have the same extraordinary depth of character as the exquisite swine flesh at Pitt Cue, there was still plenty to savour. The crunchy, unctuous crackling was bettered only by the quiveringly salty and richly juicy fat. 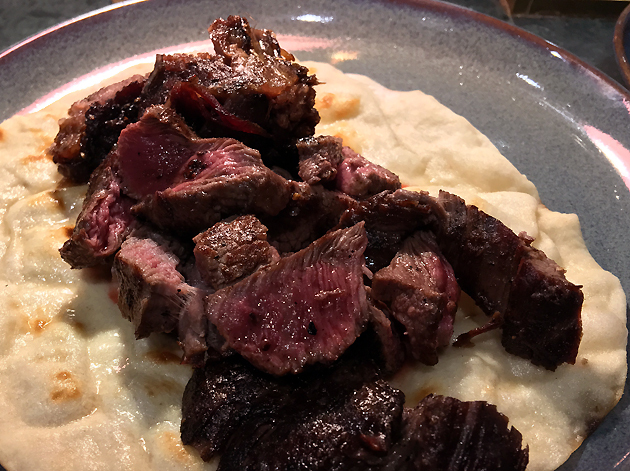 As with the beef from my first meal, the thin flatbread wasn’t quite up to the task of absorbing the rich run-off juices. Think of Temper as a sitting somewhere in between a chop/steakhouse and a barbecue joint. Sort of. 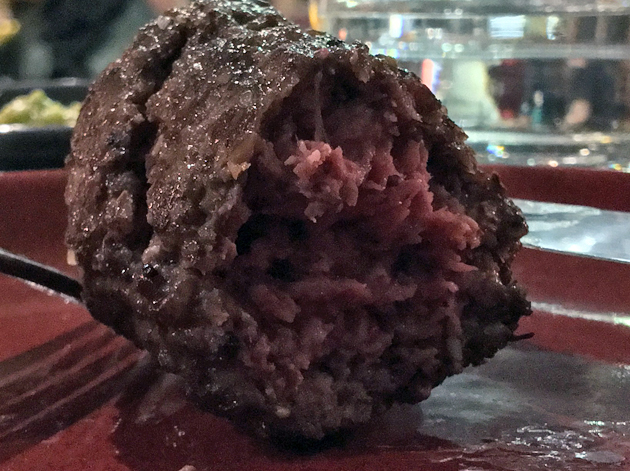 While the smoked goat wasn’t quite as funky on the tongue as I would’ve liked, it was still earthy enough with dense, moist meat layered with plenty of chewy connective tissue and skin. Only The Smoking Goat does this beast better, albeit with somewhat more inconsistent levels of quality. 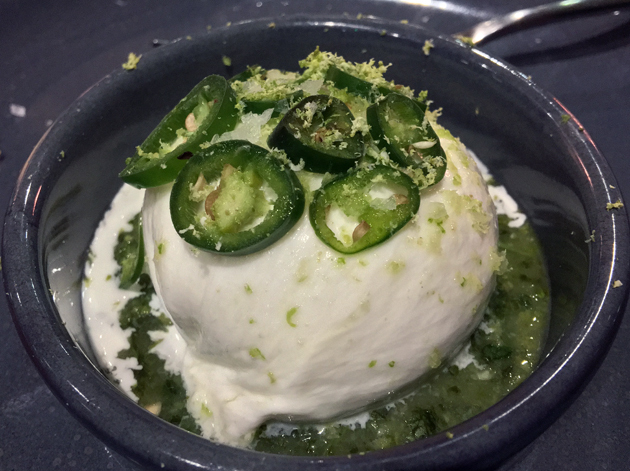 An Italian burrata seems incongruous amongst the other, far heartier side dishes, but it served a valuable purpose as a refreshing counterpart to the richer, heavier mains. Although the liquid centre wasn’t as milky and briskly cold as I would’ve preferred, it was still a mouth pleaser thanks to its creaminess and lightly chewy, elastic exterior. 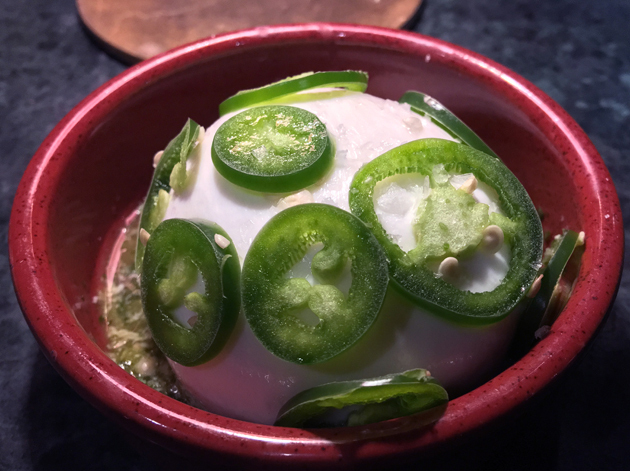 A burst of zesty lime and tingly jalapenos added extra layers of flavour that, while not strictly necessary, were at least fittingly bracing. All hail the dark lord of the twin moons. Having a giant ‘cookie’ for dessert sounds like a regression to childhood, but this six-inch pie-like dish was in no way a collection of crumbs and dull chocolate chips. Almost resembling a crème brulee in construction, the relatively crisp crust gave way to reveal a gooey soft, malty sweet interior. Although texturally pleasing, it was a tad one-note in taste. 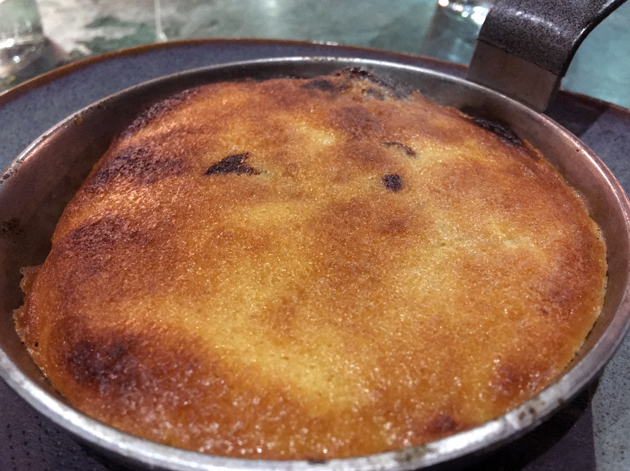 Plus, while heartier than a crème brulee and lighter than a pie, this cookie wasn’t quite as satisfying as either. Heartier than a crème brulee, but lighter than a pie. Temper’s menu changes frequently, with specials coming and going depending on what ideas the kitchen can come up with and what animal parts it has to hand. A Thai-esque dish of burnt ends started off well with a strong burst of fish sauce, herbs and chilli, but this faded quickly. The bits of beef brisket and pork couldn’t pick up the slack as they weren’t anywhere as dense or intensely flavoursome as the best American-style burnt ends. Kiln, you have nothing to worry about here. 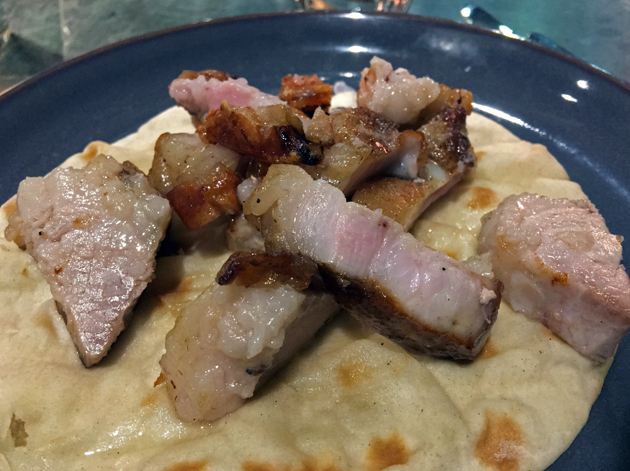 I didn’t mind Temper’s neutral-tasting tortillas for once, as a taco filling of beef fat captured and held my attention like a vice. Smooth, slick and unctuous, but also surprisingly gentle, not one drop was wasted thanks to the coddling of the tortillas. A zip of lime juice cut through its relative richness. If you feel squeamish about eating something so sublime just because it’s animal fat, then you need to leave right now. This review’s procrastination was brought to you, in part, by random cat videos on YouTube. 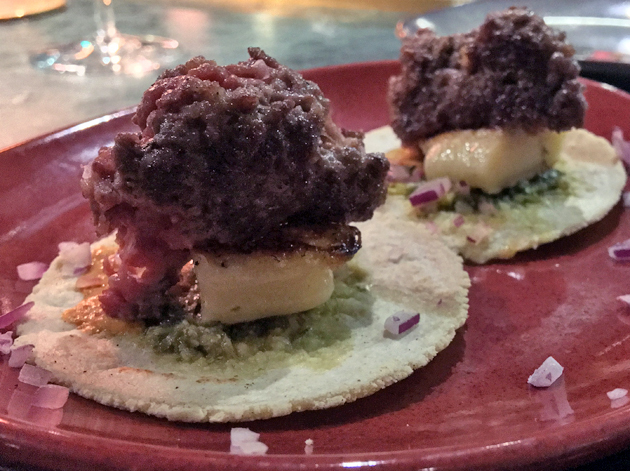 Only the cheeseburger tacos came close to upstaging the beef fat as my favourite of all of Temper’s taco fillings. More like punky hedgerows of meat rather than patties, the beef morsels were nonetheless delightful thanks to their dense, chewy, moist and woody nature. Cooked medium rare, exceptionally moreish and with a moderately coarse grind, they were more than good enough to put most full-size burgers in London to shame. And that was before the finishing touch – parmesan-crusted potato cubes for a deep umami snog and a sprightly, zingy sauce to slap you in the face and keep you from slipping into a hazy, meat-tinged daydream. Class. Pure class. Better than Killer Tomato’s burger tacos by a country mile. Or a country kilometre. 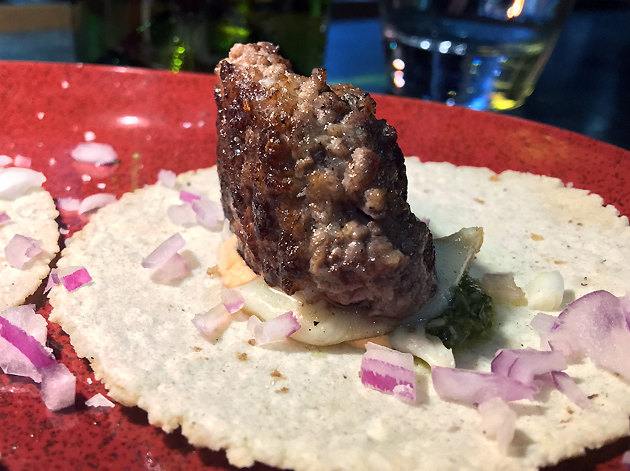 Following the superlative cheeseburger tacos, the mutton and beef kofte (also sold by weight, like the bigger meat mains) seemed like an unnecessary redux that wasn’t as good. 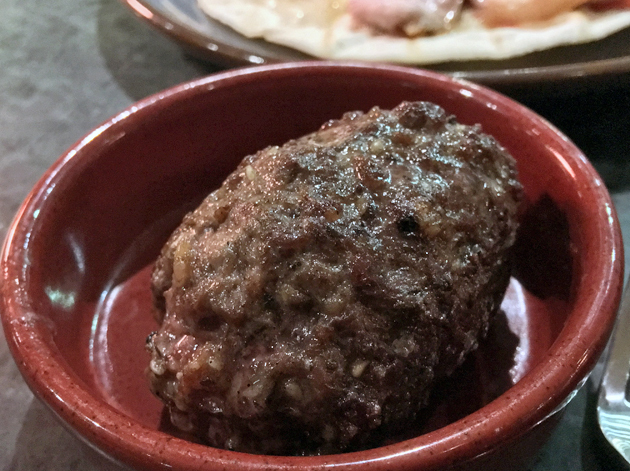 It was by no means bad though – dense, chewy, moist and moreish with a moderately coarse grind just like the cheeseburger taco patties. The only real flaw was that its slight greasiness was a bit too conspicuous with no bread, salad or sauces to mop it up. Do you want chilli sauce with that, mate? Don’t tell me about Wonder Bread. Temper does actually offer a selection of sauces and garnishes to go with its meaty mains, but I don’t think they’re really necessary. The lamb, like all the other smoked and grilled hunks of flesh available here, needed no embellishment – tender, gently earthy and with a giggly pinkness in the middle. If that isn’t testament enough to the kitchen’s care and attention, then the judicious amounts of delicately rendered fat and the lightly chewy, fruity bark most certainly are. This is better than a kebab. There, I said it. 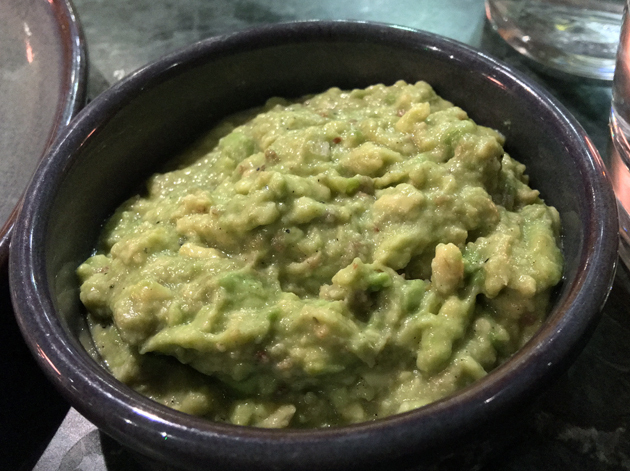 Szechuan avocado didn’t have the spicy numbingness of Sichuanese pepper, but did have a gentle sweetness and strident bright fruitiness – other, lesser known hallmarks of that cuisine – that was enhanced by the creaminess of the avocado. It was an unusual but nonetheless effective combination. I’ve always been sceptical of the merits of baked cheese, with the notable exception of raclette, but I’m willing to be persuaded otherwise. Temper’s baked cheese on flatbread didn’t change my mind. A trio of cheeses were reduced to a generic goo. Although the crispified flatbread bore a faint resemblance to a Jacob’s cream cracker, the overall effect was of a tomato-less bianca pizza. The saving grace wasn’t the ineffectual sprinkling of nuts, but a delightful honey that had a gently herby sweet, aniseed-ish quality to it. It had the nuance and depth that the rest of this pudding did not. All that glistens is not gold. 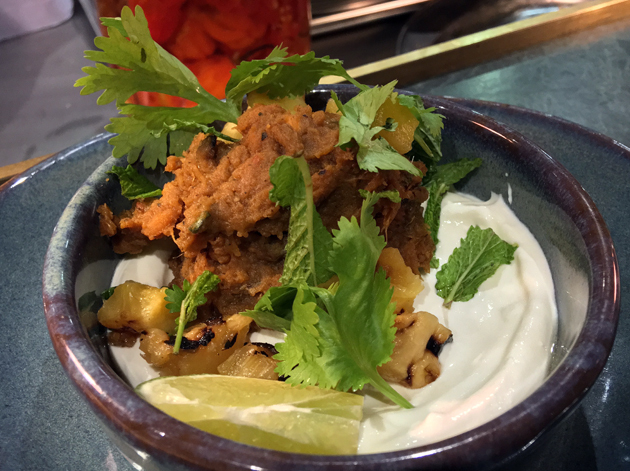 With the success of the curried Temper City and the news of a third pizza-focussed Temper coming soon to Covent Garden, it’s legitimate to ask whether the original has lost its touch or not. One thing that hasn’t improved as substantially as I had hoped is the quality of the tortillas used in the taco starters. While softer and more pliable than they had been before, their oddly chalky quality was a tad off-putting. The fillings of the two tacos I tried, while still pleasing, were noticeably less accomplished than they had been before. The miniature patties used in the cheeseburger tacos were tangy and dense with a gentle chew, but they weren’t as moist, generously sized or quite as characterful as they once were. 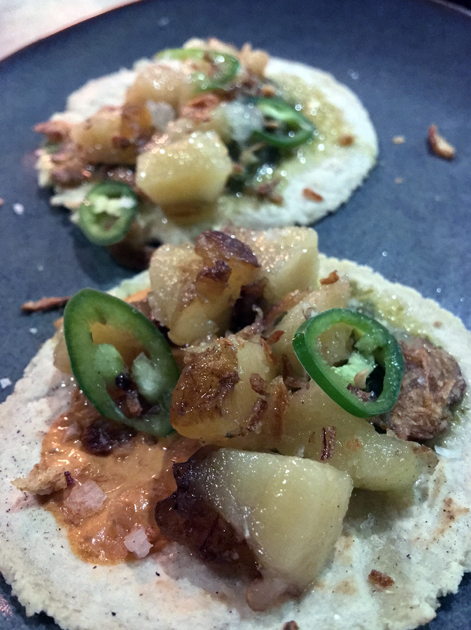 The little cubes of bovine fat and flesh used in the beef fat tacos were less like dripping and more like so-so lardo. While still unctuous enough to please, they weren’t quite as sumptuous and elegantly accomplished as they had once been. 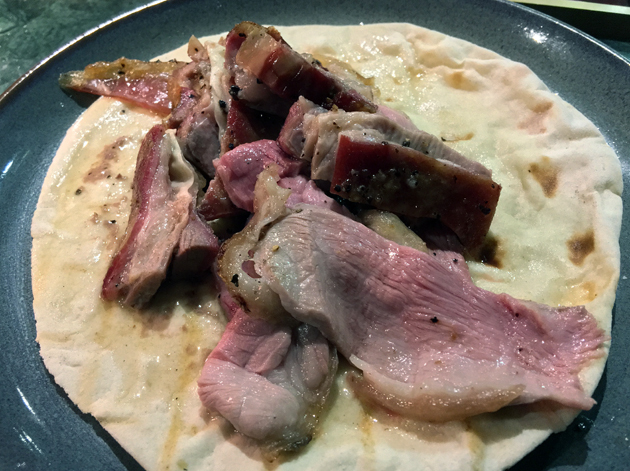 One thing that has marched forwards, rather than going backwards, is the quality of the flatbreads accompanying the grilled and smoked meats. Supple, soft and tearable with just a gentle tug, they bear a certain resemblance to the naan at Temper City. Despite the absence of appropriate wording on the menu, the meats themselves are apparently still sold by weight in 100g increments – at least according to my friendly if somewhat scattershot waiter. 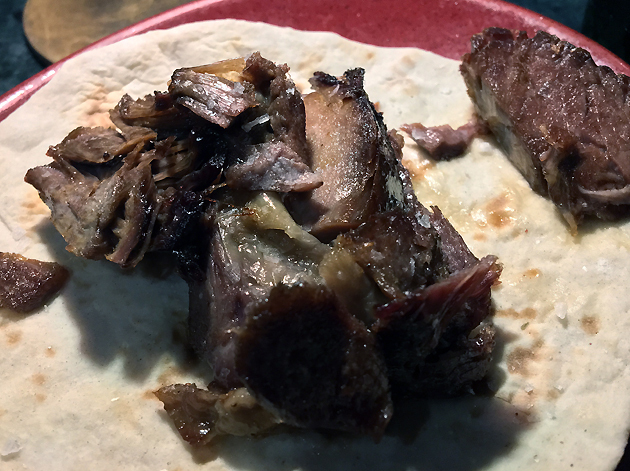 The smoked goat wasn’t bad – it was moist and tender – just a tad forgettable with none of the earthy funk that I would expect. It fell to the smoked lamb shoulder to pick up these qualities and run with them. My serving of lamb was not only a tad more yielding, it also had more quivering connective tissue. A sprightly, lightly spicy sauce and a dash of thyme were classy touches that made a big, flavourful impact. I keep mistyping ‘goat’ as ‘toga’. Slam, blam, thank you lamb. As good as the lamb shoulder was, the smoked beef edged ahead of it in my affections. 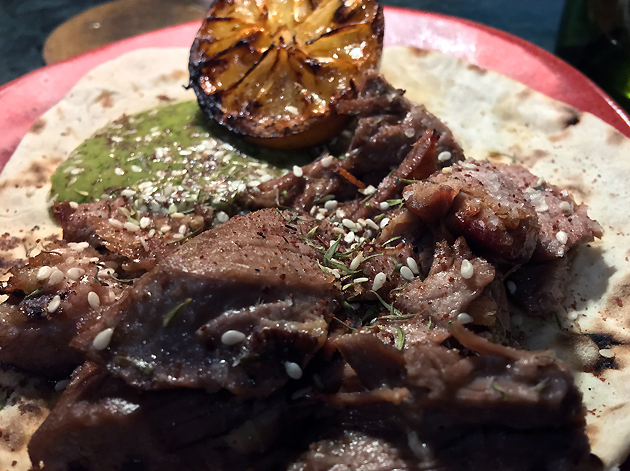 The smoky bark and the beefy tang of the tender flesh rimmed with connective tissue were simply beautiful, whether served on the prongs of a fork or within the folds of the flatbread. Time to have a cow. After all that meat, the burrata side proved to be an apt palate cleanser, even if that probably wasn’t its intended purpose. 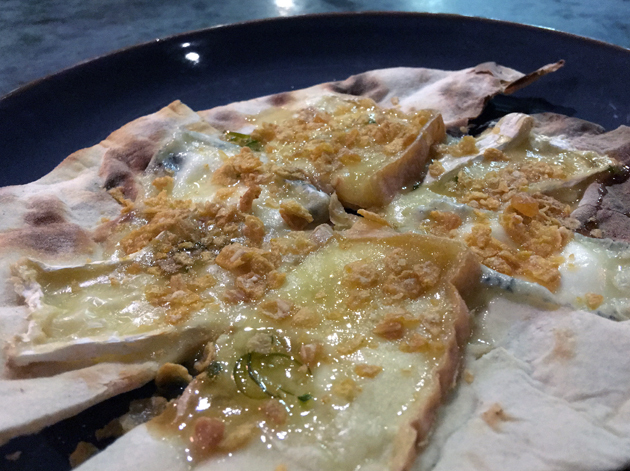 From the milky elasticity of its skin to the chilled creaminess of its interior and the tingly crispy heat of the chilli slices scattered on top, it was a damn sight better than what passes for burrata in many of the capital’s Italian restaurants. The original Soho Temper isn’t quite as polished and accomplished as it was when I originally reviewed it – perhaps Rankin’s absence on the night of my visit had something to do with it. This makes his seemingly tireless expansion of the Temper brand an interesting venture to observe. Only time will tell if he can sustain a high level of quality and execution as more branches open. Regardless, even though I’m no longer quite as enthused about the original Temper as I was when I wrote the original Verdict below, it’s still one of my favourite Soho restaurants. Temper isn’t perfect. 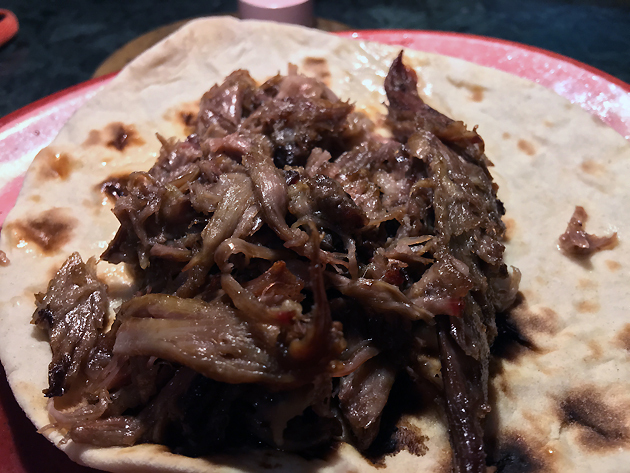 Some of the tacos need work (especially the tortillas and indeed the other breads), while the desserts aren’t anywhere as accomplished as the carved portions of meat which serve as the mains. But what mains they are – a love letter to carnivores sealed with a juicy, flame-licked kiss. The various cuts of meat were smoked and grilled with care and dedication leading to self-evidently superb results. The question with Temper isn’t whether you should go, but how much beautiful bounty your stomach can hold. Opening Hours: Monday-Wednesday noon-22.30; Thursday-Saturday noon-23.00; Sunday and Bank Holidays noon-18.00. Reservations: highly recommended the closer you get to the weekend. Average cost for one person including soft drinks: £50 approx. Tags: aubergine, avocado, beef, beef brisket, brisket, burger, burnt ends, burrata, chop, cookie, crab, egg plant, goat, kofte, london, pork, restaurant, review, smokehouse, steak, sweet potato, taco, temper. Bookmark the permalink.